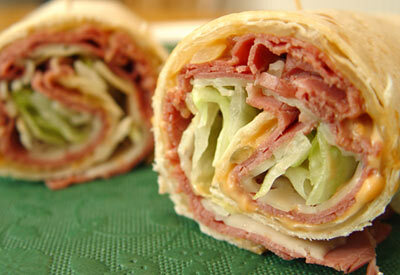 Instead of traditional Corned Beef and Cabbage, roll it up in a tortilla! In large skillet, melt butter. Add half the corned beef and cook until hot and edges begin to curl, about 5 minutes. Transfer to dish; cover to keep warm. Cook remaining corned beef. Heat tortillas according to package directions; keep warmed tortillas covered. Spread tortillas with dressing. Place beef on dressing; top with cheese and lettuce. Roll up tortillas and serve.